It’s 2030 and you’re not doing your old job any more because an AI machine can do it faster, cheaper and safer. How’s that working out for you? But, first of all, let’s deal with some basic logic. How fair is this? Bit harsh on Steve, yes? He was only answering the question that was put to him. If their Mum wasn’t there, he had an idea of what could happen. He wasn’t asked whether he thought she might be. Silly? Maybe. But that’s exactly what the economists and the right-wing press did to Professor Stephen Hawking a while ago on the subject of robot automation and unemployment. 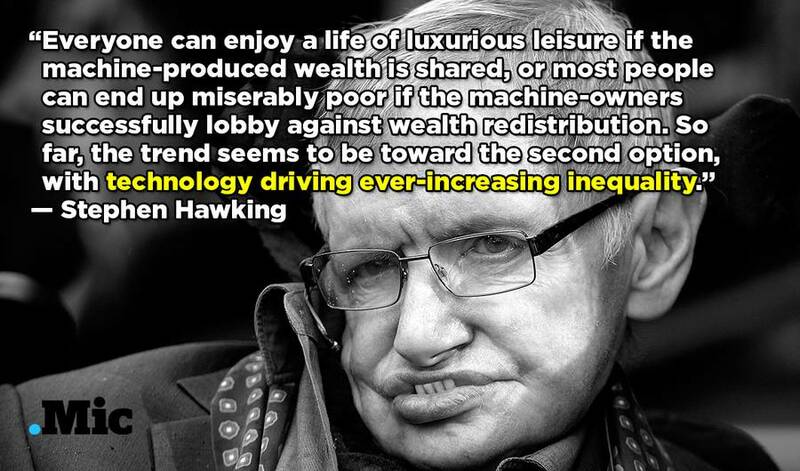 Professor Stephen Hawking provoked considerable debate recently by suggesting that we could have more to fear from the nature of capitalism in future than armies of intelligent robots. The response was immediate, robust, deeply personal and entirely predictable. Scientists should stick to science. So how much of this criticism was justified and how much of it was simply The Establishment closing ranks?